Although not a resort, the International Tennis Hall of Fame & Museum belongs on every avid tennis player's list of places to visit—and not merely because it has been designated a National Historic Landmark. 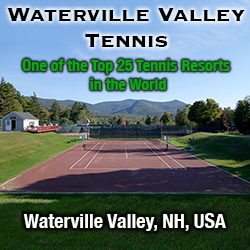 The complex includes the Newport Casino Lawn Tennis Club, an array of 13 grass courts remarkable for welcoming the general public and significant as the site of the first-ever U.S. Tennis Championships. Think of those lawns as themselves a kind of interactive exhibit: you come to Newport not only to stroll through the world's largest collection of tennis memorabilia in the museum but also to experience the sport on its original surface. Whether you choose to use a wooden racquet for the full effect is entirely up to you. Designed in Shingle Style by the architectural firm of McKim, Mead, and White, Newport Casino opened in 1880 as a social club with a roster of such bold-face Newport families as the Vanderbilts, Astors, Wetmores, Belmonts, and Oelrichs. Its founder was James Gordon Bennett, Jr., the wealthy publisher of the New York Herald and himself a prominent Newport cottager. In a nod to a sport that was becoming very popular at the time, he laid out some 40 grass tennis courts, many of them viewable from the latticework porches of the Casino itself. Although the acreage devoted to courts has shrunk over time, Newport Casino has taken on enhanced resonance as the home to the International Tennis Hall of Fame & Museum. You can and should come to play on these lawns, but you will also want to venture upstairs into the suite of galleries housing the Museum's interactive exhibits devoted to the sport and its greatest players. Touch-screen kiosks let you view photos, stats and often video of any of the 218 players already enshrined in the Tennis Hall of Fame or test your knowledge of tennis trivia. Later galleries take you chronologically through the evolution of the sport, touching on the players, clothing, and equipment that changed the game, including Ted Tinling's fashionable tennis dresses to the portable nets used on Jack Kramer's barnstorming professional tour. Vitus Gerulaitis' red Rickenbacker electric guitar is here, so is Serena Williams' cat suit (but not, that I saw, Andre Agassi's mullet wig). And as long as you're here, head over to the Casino's Court Tennis court to experience what the game was originally like (a mix of tennis, squash, and chess). Pros are on hand to walk you through the rules and technique—and, not incidentally, to hand make the cloth-covered cork-center balls the game requires. Just don't get addicted, because other than Newport, there are only nine other Court Tennis courts in the U.S. and all of them are private. The first clue to how differently grass plays comes the moment you drop a ball to start a rally, only to see it rebound barely at all off the turf. That might seem to be a recipe for frustration, particularly for players with modest skills. The solution is not to take it seriously and have fun, relishing the joy of playing at the Hall of Fame. Tennis Staff. Former ATP touring pro and past Wimbledon mixed doubles champion John Austin takes over as director on Apr. 1, 2015. In the press release about his new position, Austin says, "I am looking forward to being part of the club's future, especially with the renovations and programming which are sure to be an integral part of the club in the years to come." As I learn more about his plans for programming I'm post those here. Tennis Programs. In years past, during the mid May through September outdoor season, the professional staff at Newport Casino offers private lessons, weekly clinics and social round robins, and Cardio tennis workouts. There is also an on-going junior program designed for locals but that can accommodate visiting juniors. It is likely that Austin will offer some enhanced variation on those options. Courts & Fees. 13 grass courts, three hard indoors, and one Court Tennis court. Court fees: $45/person/hour on grass. La Forge Casino Restaurant serves lunch and dinner year-round, though in summer you'll have the option of dining on the Porch overlooking the grass on the Horseshoe Quadrangle or on the sidewalk in front of the Hall of Fame. America's last grass-court event on the fabled lawns of Newport Casino. Before play on Saturday, they will hold the induction ceremony for the newest members of the International Tennis Hall of Fame. For more information, visit Campbell's Hall of Fame Tennis Championships or phone: 866-914-FAME. The Hall of Fame offers some adult non-boarding tennis camps at selected dates throughout the summer. Details are available from the Hall of Fame Play Tennis page. If you're looking for lodging options, check out these Newport Hotels. Of those, the Hotel Viking also on Bellvue Avenue and not far from the grass courts is one the International Tennis Hall of Fame often uses for its events. Seasons. Year-round; however, the grass-court season runs from mid-May through September. Travel Instructions. By air: The nearest airports are T.F. Green Airport (PVD) in Warwick, 26 miles to the northwest, and Boston Logan International Airport (BOS) 74 miles to the east. Major carriers serve both and rental cars are available at either. By Train: Amtrak stops at West Kingston, 18 miles to the west, and Providence, 34 miles to the north. General Tourist Information. For information about vacationing in Newport, visit the Newport & Bristol County Convention & Visitors Bureau, 23 America's Cup Ave. Newport, RI 02840 or phone toll-free 800-326-6030. Or for information about Rhode Island as a whole, visit the Rhode Island Tourism Division website or phone toll-free, 800-250-7384. Here's what others have had to say about International Tennis Hall of Fame. "Prior to attending the Adult Tennis Camp to be held on the grass courts of the HOF, I had already played on terre battu in Paris, har-tru, Deco Turf, hard courts, Omni Courts (sanded artificial grass) and indoor carpet. I wanted to fulfill my goal and finally play on natural grass, so when I heard about Mary Rompf's tennis camp I knew I had to attend. I enrolled in the 4-day camp (instead of the 3-day camp), but because of low attendance I could only physically handle 3 days since we were getting so much action individually. It was terrific instruction by Mary and Drew. I needed a lot of net play drilling and boy did they deliver.